OFFspace is a not-for-profit, artist run curatorial cohort, a nomadic venture exploring genuine site-specificity, artists examining the relationship of place, history, and object. Our goal is to explore vital ideas and phenomena, and central to OFFspace’s mission is our drive to educate, engage and inspire our fellow artists and the public. Art isn’t made, nor does it exist in a bubble, separate from current events for the enjoyment of a privileged few. Art is a means of communication and engagement not only reflecting, but informing, cultural, social and political conditions. 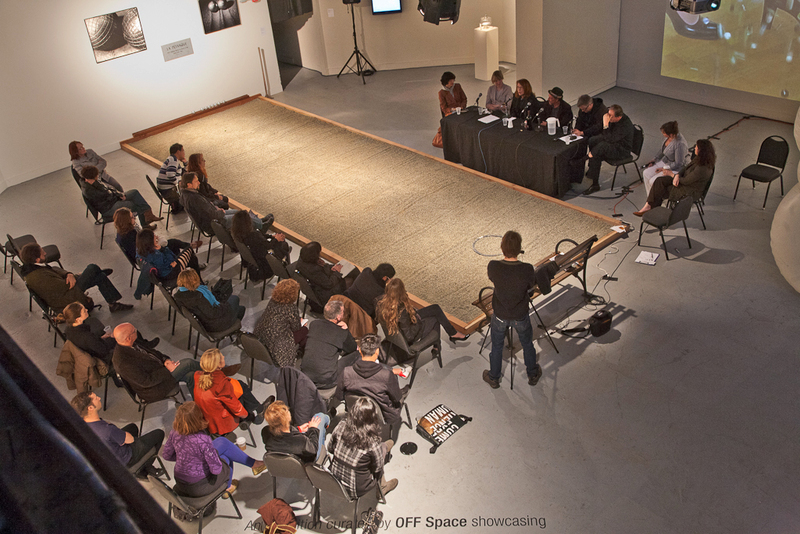 Another essential aspect of our mission is connectivity: OFFspace positions itself as a place to encourage dialogue between the public and its artists. Along with exhibitions we invite researchers and specialists in various fields to participate in panel discussions, organize performances and happenings as well as classroom lectures. Shunning elitism, we’ve been presenting the work and ideas of emerging and established artists from around the world together, as a means of stimulating dialogue and providing an inclusive platform for diverse voices regardless of race, nationality, gender or identity preference. We at OFFspace further serve our public and the artists we work with by staging artists talks, participating in roundtables and lecturing at universities and colleges to inspire and mentor artists and aspiring curators. Emmanuelle is a curator and conceptual artist who marries sculpture and photography in exploring the ever-shifting concepts of identity and portraiture in a mutating world. Emmanuelle received her MFA from the San Francisco Art Institute and has exhibited her work throughout the U.S. She maintains an active dialog with European museum directors and curators and brings to OFFspace her background as a business analyst as well as her talent as a photographer. Kathrine is a Bay Area based interdisciplinary artist and curator for whom curation is an extension of her personal artistic practice. She earned her MFA in New Genres from the San Francisco Art Institute in 2005 and has curated shows for 21 Grand, Art Engine Gallery and three Garage Biennale Pavilions as well as vacant warehouses, a derelict train station and an Italian internet café. She has exhibited work throughout the U.S., Europe and China. Founded as a brick-and-mortar venue in 2007 by Kathrine Worel and Julija Learie, we operated under the sponsorship of a tech start-up that donated space. It was great having walls of our own, but when the start-up stopped, we had to re-examine our exhibition strategy and goals. Julija left to create her own start-up and Emmanuelle Namont Kouznetsov and Elyse Hochstadt joined up to make a great three-some focusing on at-large curatorial projects. Two years, and several outstanding shows later, Elyse left to focus on other projects. Now Emmanuelle and Kathrine are a “Dynamic Duo” focusing on site-specific curation and bringing together a wide variety of artists from around the globe.